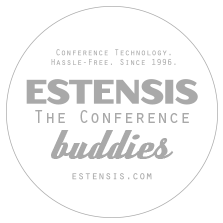 More than 20 years of experience in organizing and providing technological concepts and strategies for scientific conferences all over the world means: ESTENSIS is your personal "CTO” – your Conference Technology Organizer. Always at your side! Always with a smile! We are your full-service technology vendor, close partner and a consultant for PCO’s and scientific societies. Our approach to be the cornerstone of your conference success is way more than just advanced technology and enthusiastic and skilled staff. It is our passion for your daily business and it is our commitment to inspire you! Take advantage of more than 20 years of experience, more than 300 familiar venues world-wide, more than 1,800 facilitated conferences and almost 1 million managed digital presentations. Let us be your reliable partner, your quality-focused friend. Let us be your “Conference-Buddies”. The „buddy system“ is a well-known safety- and supporting procedure in companies and organizations, in scientific education and in sports. It means having a reliable partner and friend at your side, who always takes care of your needs and who ensures that you can reach your goal in the safest and most effective way. Our aim since 1996. In 2013, we created the digital successor of paper posters and a binding scientific ePoster standard. Interested? Showcase meetings in Europe are free of charge! Way more than just a presentation check-in or a speaker’s lounge. Let us lay the “cornerstone” for your conference success! 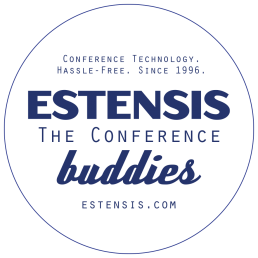 Imagine a user-friendly conference registration tool, provided by ESTENSIS! Benefit from our own broad logistical solutions and our long-lasting experience in world-wide conference shipping! Bring your onsite happening conference “in the air” and create a precious online information- and education portal! Just in time! Just now! Simply good and functional abstract management. Not more. And not less. Make use of our expertise and of more than 20 years in technological conference planning. Your outsourced CME accreditation management. Up to date! Compliant. Reliable. Experienced network experts will assume all proceedings and negotiations with the chosen venue and provide state-of-the-art IT for all aspects of your conference. An automated slide-management system in a lecture hall is mandatory today. Combining it with skilled and enthusiastic staff is really smart! Using the inhouse AV installations or better ESTENSIS technology? Let us discuss all essential aspects with you! Budget, technological requirements and logistical topics. Not just another personnel service provider but a scientific conference experts team! It’s up to you: integrate our “smart vote” portfolio into your conference app. Or simply use our latest hardware-based voting technology. ESTENSIS has been supporting conferences all over Europe - and world wide - since 1996. We are a full-service technology vendor, a close partner and a consultant for PCO’s and scientific societies. What can the Conference Buddies do for you?